The Vampire Diaries Music from "The Devil Inside"
The Devil on the inside of Damon Salvatore came out this week. But while The Vampire Diaries Season 5 Episode 12 featured this blood sucker returning to his dark roots - along with Tyler finding out the truth about Caroline and Katherine taking over Elena's body for good - it also featured some great tracks once again. Forget spoilers, photos or quotes for a moment. The Vampire Diaries music is always worth checking out and downloading. 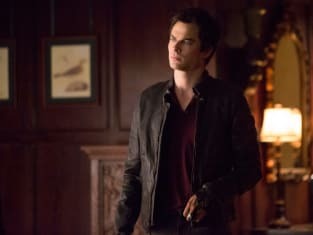 Damon: One who hovers and sticks his nose in other people's business. Wait... I was defining "annoying." Permalink: One who hovers and sticks his nose in other people's business. Wait… I was defining "annoying." How's my dress? It screams safe and predictable. Am I right? Or am I right? Permalink: How's my dress? It screams safe and predictable. Am I right? Or am I right? The Vampire Diaries Round Table: "The Devil Inside"